Buried forests and trees provide direct evidence of the vegetation in Illinois at a specific time. Ice age sediments sometimes buried trees and even entire forests. There were several ways this could happen. Advancing ice overrode forests and buried them with glacial drift. Loess (the oe is pronounced like the oo in book), wind-blown silt, coming primarily from the Mississippi and Illinois River valleys, buried forests over a long period of time. Advancing ice also dammed lakes, causing lake levels to rise and flood surrounding forests. Rapid build-up of sediments in these dammed lakes resulted in the burial and preservation of trees in place without any other damage. Trees remained standing as they had been 18,000 to 24,000 years ago. The glacial ice advanced into Illinois about 26,000 years ago. A relatively open-canopied spruce forest with an understory of terrestrial mosses developed near present-day Charleston, Illinois, just prior to 24,000 years ago. The glacial ice reached its southernmost extent only a few miles south and west of Charleston at Shelbyville, just after 24,000 years ago. A lake formed in front of the advancing glacier (proglacial lake), possibly as the result of a damming of the local drainage areas by glacial sediments. The lake flooded the forest and killed the trees, which were rapidly buried in the lake sediments. The advancing glacial ice then overrode the buried forest depositing glacial drift. The trees were not knocked over as they are during torrential floods. Rather, they remained upright where they grew, rooted in an old soil that had developed before the last glacial advance in central Illinois. Some of the stumps are over 2 meters tall with diameters of 12 to 25 cm. The sediment that was deposited was laid down in layers typical of still water. The layers could represent the differences in sediment from year to year or from season to season. Forest beds also frequently occur at the base of lake sediments. These forest beds or 'trash layers' contain a record of forest vegetation that occurred before the lake developed. In Illinois, these trash layers occur in kettle and thermokarst lakes. Kettle lakes form when a block of buried ice left by the retreating glacier melts and forms a hole, sometimes quite deep. Thermokarst lakes develop when permafrost (permanently frozen ground), melts locally and forms a shallow depression. Forests growing on the surface before the ice block or permafrost melted fell into the newly created lake and formed the trash layer that was later buried by lake sediments. 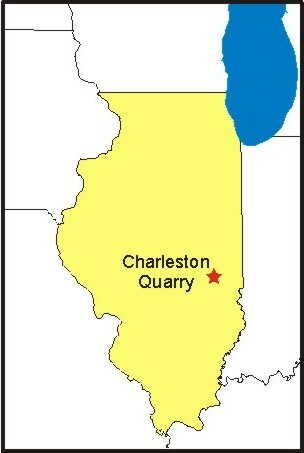 Crystal Lake in northeastern Illinois (map) has a thick trash layer, which formed about 16,200 years ago. Scientists from the Illinois State Museum and Illinois State Geological Survey are now studying this deposit. Scientists from the Illinois State Museum have also studied the trash layer in a thermokarst lake near Tonica, Illinois. A Museum archeologist discovered this lake while doing survey work before the construction of Interstate 39. It was in a farmer's field and had been drained. The lake formed about 17,000 years ago. As the permafrost gradually melted, spruce trees and other forest plants fell into the expanding lake. The skeleton of a now-extinct stag-moose (Cervalce scotti) was also discovered near the shore of the former lake. The skeleton showed evidence of chewing by wolves, which may have killed the animal in winter on the frozen lake surface. The bones then fell into the lake when the ice melted. Buried spruce logs at Tonica. The age of the deposits can be determined by radiocarbon dates on wood, cones, or needles from the spruce trees. Stumps at Charleston, for example, dated at 24,000 years old. A spruce log from Tonica dated at approximately 17,000 years old. Pollen sequences, macrofossils (leaves, snail shells, insects, bones of other small animals) preserved in buried lake sediments, and the buried spruce trees at Tonica and other sites tell us about the paleoenvironment (paleo = old) in Central Illinois just after the last glaciation.